If you have ample space and a large window for sunlight to enter the kitchen, here is a design that evokes praise from those who long for timeless charm and elegance. The kitchen has a lot of natural light as a result of a large glass wall on the left side. Placing plants in pots just outside the kitchen increases the natural quotient. The front wall is the main wall that is used for the cabinets as well as the counter-top. The use of brushed brown mica and aluminum in combination creates a magical effect that is beyond description. A dark brown rug is placed in the central space of the kitchen while the dining table with chair is placed in the right of the kitchen. The floor is made up of large tiles that are grey in color and add to the decor of the place. 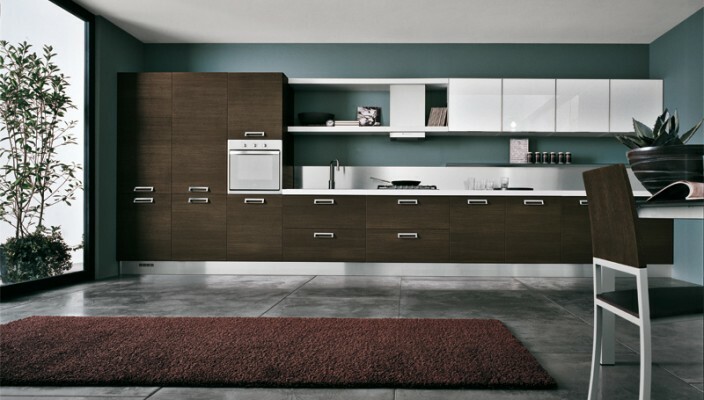 The wall is painted light blue that presents a decent contrast with the cabinets and the brushed aluminum.